Architect of the Capitol Stephen T. Ayers, FAIA, LEED AP, reflects on the AOC's role in supporting the annual State of the Union Address. Every winter, Congress has the honor of welcoming the President of the United States to the U.S. Capitol for the annual State of the Union Address. As we do every year, the Architect of the Capitol (AOC) works behind the scenes to ensure that everything is impeccable for this important event — even the smallest details, like monitoring the temperature to ensure it's comfortable for the hundreds of members, staff and visitors who fill the House Chamber. Some of our roles are visible the evening of the State of the Union Address. Our visitor assistants direct visitors and guests to the correct locations, and at times, provide interpretive tours of the Rotunda and Statuary Hall, historic spaces visitors walk through on their way to the House Chamber. Leading up to the event, Architect of the Capitol employees ready the House Chamber where the President's Address occurs. This responsibility includes cleaning, maintaining the infrastructure to the sound system, preparing the lighting and monitoring the electronic temperature system. All of these behind the scenes tasks ensure the event occurs without a hitch. 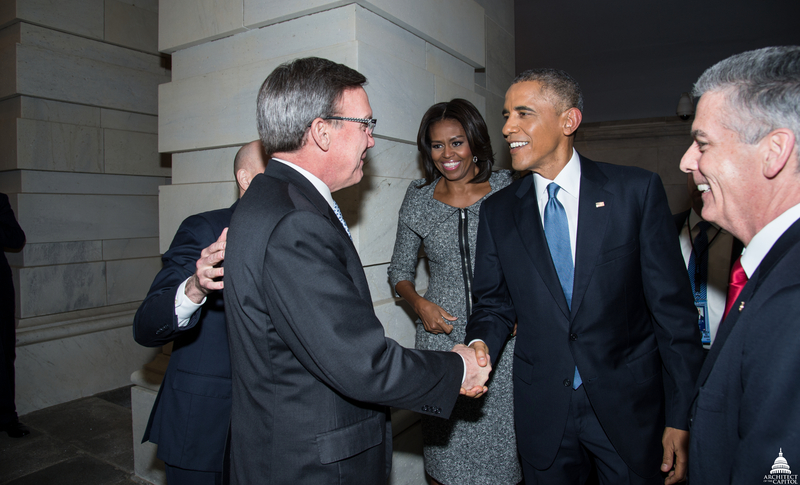 Greeting President Obama before the 2012 State of the Union Address. As Architect of the Capitol, I am responsible — along with my fellow members of the Capitol Police Board, the House Sergeant at Arms and Senate Sergeant at Arms — for greeting the president at the House entrance of the Capitol and escorting him to the room where he waits for the event to begin (pictured right). I then monitor the Address from a seat next to the Speaker's rostrum in the House Chamber. From this location, I can provide real-time updates to our employees monitoring the Chamber, so they can make adjustments as needed. These types of high profile events require the cooperation of hundreds of federal employees, representing many different federal agencies. Since the State of the Union Address qualifies as a National Special Security Event (defined as the formalization of the security responsibilities of numerous federal agencies charged with the development of plans for a major event), the Capitol Police Board members coordinate with other law enforcement agencies in order to best support and protect everyone attending the event. It's a huge task, but one that we at the AOC take great pride in supporting. Events such as the State of the Union Address allow our employees to achieve our mission of serving Congress, preserving America's Capitol and inspiring memorable experiences for all who work and visit Capitol Hill. I look forward to attending the President's Address and representing the hardworking men and women of the AOC. I believe the AOC-One Team,One Mission, should be proud of the work that is done, on a day-to-day basis, to ensure that the Congress, The Supreme Court, and the People, are in a position to really enjoy the fruits of our work. It is worth every penny! Thank you all for the great work you to do to keep our Capital looking Great, New, Clean, and us proud to be an AMERICAN. Thank you and ALL of the hard workers at the Capitol. It's hard for folks to understand what goes on "Behind the Scenes," and this is most helpful to share with them.